Maintaining your foundation walls is key for the structure of your home. They are relied upon to secure the integrity of your home by being providing a strong base of support for your structure. The foundation needs to be built on solid ground to reduce the chance of movement and failure of the structure. It is common for the foundation to be installed over 8 feet under the finished grade of the property. 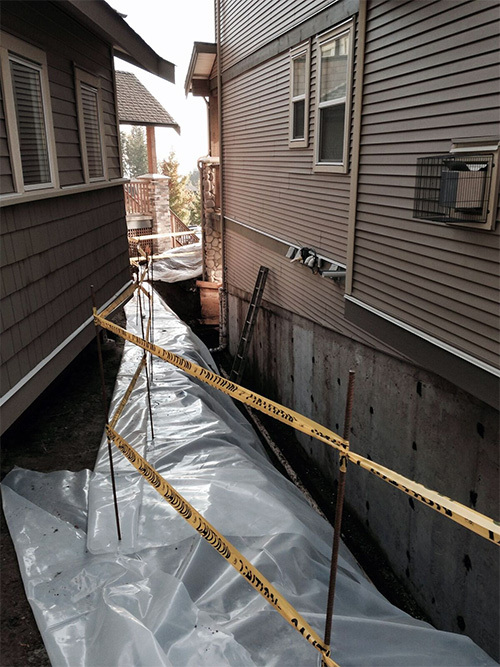 Although there are multiple reasons for installing drainage around your foundation, its primary function is to reduce deterioration of your foundation and its components, remove any hydrostatic pressures that may be applied to the foundation walls, and remove any moisture that could cause damage to the structure. Concrete is a naturally porous material. A foundation damp=proofer is applied to any foundation walls that have living or crawl spaces buried below the surface. Damp proofing stops the movement of water through your foundation wall. It protects the reinforced steel in the foundation from water damage which could lead to structure failure. Damp proofing includes applying an elastomeric product to all foundation ties and applying and emulsifier to the concrete foundation. Damp proofing is only effective against hydrostatic pressures up to 3 pounds per square inch. If the building exceeds hydrostatic pressures, a water proofing membrane should be applied to the foundation. There are many products that will meet the needs of a foundation waterproofer. The one that we recommend installing is a dimple membrane. This membrane is a plastic sheet with dimples on its surface that allows water to flow easily to the drainage system. It is secured to the foundation wall during the installation of the drainage system. If your foundation has developed a crack, water may be penetrating through and causing damage to the interior of your home. It will also corrode the reinforcing material that was installed in the foundation during construction. Properly repairing these cracks will stop any water damage from occurring in your home and will greatly reduce risk of foundation failure. Cracks normally run from the top of the foundation to the bottom, often being very hard to see. Repairing these cracks starts with digging a hole to your footing, grinding away any emulsion, crack chasing with a special tool, cleaning and drying the surface, applying a primer for the membrane, applying an elastomeric product in the crack, applying a rubber membrane, then finally backfilling. Honeycombing is a term that is used when concrete is not vibrated properly during installation. Hydraulic cement is a product that is used to repair honeycombing in foundation walls. If you feel you have a foundation issue, contact Perimeter Drainage Ltd and we will send out one of our qualified personnel to assess your issues.